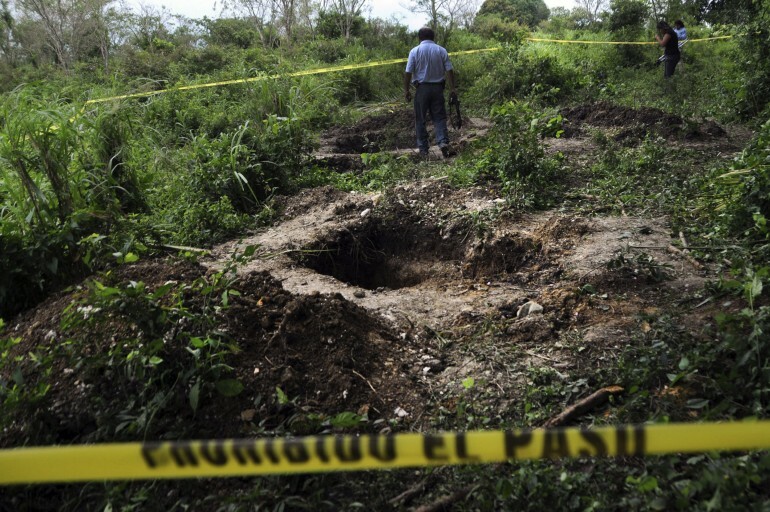 Aristegui Noticias reports that authorities in the Mexican Gulf coast state of Veracruz have uncovered the bodies of at least 31 people from a clandestine grave located on a ranch near the border with neighboring state of Oaxaca. Twenty-four of the bodies are said to belong to men, and the other seven to women. Many of the cadavers showed signs of mutilation, including burns and dismemberment. The state attorney general’s office says investigations will continue, with the help of forensic experts. It does not rule out the possibility of finding the remains of additional victims. SDP Noticias writes that the discovery was first made on Monday by members of the Mexican navy; state police have since blocked off access to the remote ranch, dubbed “El Diamante,” where the mass grave was found. The site also cites rumors among inhabitants of the region, who say that the bodies found belong in large part to migrants who were passing through the state on their way to the United States. Veracruz is an important point of transit for migrants who hitchhike on cargo trains; in the city of Coatzacoalcos the railroad lines diverge before continuing northward. In recent years, as the Zetas drug cartel has gained increasing influence in the state, Veracruz has seen crime and violence rise, including against migrants. Reports of crimes against undocumented migrants on their way through the state increased 172 percent in 2013, according to Animal Politico. The Zetas and local bandits who work for them often charge a toll (usually between $100-200) on migrants who try to use cargo trains to head north -- three municipalities in the state account for almost 85 percent of all complaints from migrants who say they were extorted for a fee to ride the trains. David Iaconangelo is a Brooklyn-based writer and translator. Formerly editor of ZafraLit, a blog of new short fiction from Cuba. He has lived in and reported from various Latin American countries.